Echopraxia sounds like it's the start of a bad sci-fi TV series. What happens when you put hibernating monotheistic monks, an acolyte, a pilot, a military officer, a biologist, a vampire, and a small army of zombies on a space ship heading for the sun? Not wacky hijinks, as TV would tell us, but something much, much better. 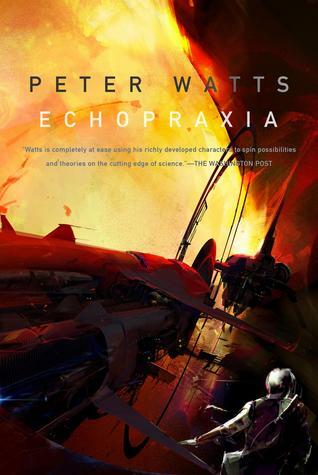 Echopraxia follows Daniel Brüks, a so-called baseline human for being non-augmented in a time where everyone is augmented, in the role of the main character and the biologist in this crew. Daniel gets swept up in an attack on a Bicameral Order monastery and winds up on the Crown of Thorns, a Bicam ship headed for a platform close to the sun. How he ended up on the ship, what his role is, and what their mission was to begin with is all revealed in a more or less break-neck pace. The story moves rather fast but not at the expense of approaching some topics of excellent discussion. The Bicameral Order practice science with faith. They're posthumans trying to find God. Heaven is also a place, and you can talk to people there. Brüks is a skeptic, and his discussions with the acolyte Lianna touch on the importance of faith and the role of God in a posthuman world. The pilot seemingly hates him, and the colonel takes him under his wing, but both of them are on the ship with their own motives. And then there's Valerie. Valerie, the vampire. You see, science resurrected vampires, and they're even more lethal than most stories portray. They're so dangerous that they're normally kept contained and separate from each other because of the threat they pose to everyone else. She's got the classic vulnerability to crosses, but she's leaner, smarter, faster, and stronger than anyone else on the ship. She's rivaled only by her zombie bodyguards. They're not the shambling type, but the mindless, strong, hard to kill type. She's obviously the wild card of the crew and she's the most intriguing character among them. The mystery of how the crew was assembled and what their mission is is the central conceit, and it's fantastic. Everyone has their own motives for being there, except Brüks, but even he has a purpose. The way Watts pulls the crew together and then jams wedges between them is excellent. There is a constant feeling of building tension as the crew learn more about each other, and it's extremely satisfying when everything pops. If I have one complaint, and it's incredibly minor if you're a fan of hard sci-fi, it is that it is sprinkled with technical jargon. However, even if you don't grasp it all (I'm no biologist, so I didn't), it conveys enough to get the gist. It doesn't necessarily detract from the story, but it will give cause to slow down a it. Slowing down, though, is hard. Echopraxia moves swiftly and doesn't let up once it gets started. It's very hard to put down because of the intricate relationships of the crew. Though it's the second part of a series, it doesn't suffer from "middle of a story" problems, but it did make me want to go back the first part. It's the kind of story that asks a lot of questions, answers most of them, but left me thinking about it long after I finished it. It's excellent.